Larry Peer lectured at the International Cinema on an important cultural shift in Russian film that began with The Cranes Are Flying. Dr. Larry Peer discussed how The Cranes are Flying marked a monumental shift in Russian cinema. PROVO, Utah (Feb. 2, 2016)—During World War II and the immediate aftermath, the people of the Soviet Union were unable to fully process their collective experiences from the war in a genuine, emotional way. Instead, strict regulations during the Stalin regime caused what comparative literature professor Larry Peer, at the International Cinema lecture, described as a propaganda-exclusive approach to reflections on the war. In those war years, censorship abounded and the Russian film industry reached its lowest point. Yet, according to Peer, when Stalin died in 1953, the once frozen film industry began to thaw. Russian filmmakers could once again explore the artistic ambiguity of their medium, and from the subsequent thawing came an outpouring of artful films from 1956 onward. One of the most impactful filmmakers to do so was Mikhail Kalatozov, a Georgian director who was awarded the Stalin Prize for his propaganda films during the wars, but quickly turned back to directing the true kind of art he loved. The Cranes Are Flying (1957) was one of the first films to truly explore the Russian experience of the war in its complexities, Peer explained. The story of a young couple’s love interrupted by the war, the film explores the plight of women left at home, draft dodging and the public opinion on the experience of war. As Peer explained, propaganda films are focused on the flat content they present, effectively driving their message. In contrast, the artistic films Kalatozov wanted to create are more focused on techniques derived from deeper theoretical aspects of filmmaking that seek to give the viewer a greater tolerance for ambiguity, inviting the viewer to contemplate as they watch. The film achieves this through its use of camera angles, juxtaposing extreme opposite shots that cause the reader to have to construct the truth that lies within the parameters set by the camera. 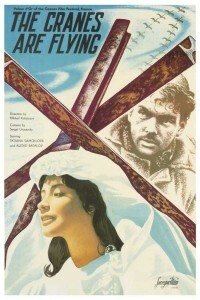 This encoding, Peer said, is “[Kalatozov’s] rejection of his previous propaganda films and opens up a new era of freedom in Russian cinema.” This technique had also never been the key cinematic element in Russian film, and designates The Cranes Are Flying as a landmark piece in Russian cinema. Two particular images repeated throughout the film present this sense of artistry, and Peer encouraged the audience to give them special attention. The first, the cranes of the film’s title, are an important symbol of freedom in Russian and Asian iconography. The second, flowing water, symbolizes the constant passage and uncontrollability of time. Both of these symbols directly relate to the newly emerging freedom from the rigidity of the Stalin era – a breaking free of old restrictions to find healing through art. Peer concluded by touching on what he called the “sense of Russianness” in the film. He described it as a sense of impending catastrophe, or a feeling that just outside the frame there is something dark and unexpected coming. This sense was compared to the tone of some 19th century Russian literature, and Peer cited this sense as a source of interest and enjoyment in both of these mediums. Alison covers the Department of German and Russian for the College of Humanities. She is a senior studying English teaching with a minor in music.